With technology evolving every day, it doesn’t come as a surprise that we’re constantly faced with changes. Luckily, many changes increase the convenience of homeowners’ lives. Every day we are presented with new technology and you probably know the feeling of wanting to own the next best thing. This is no different when it comes to your garage. Garage openers have been around for decades, but it’s worthwhile to avail yourself of new developments in this market. Some of it won’t even cost you a cent. This review showcases free garage door opener apps. Yes, with the advances in technology, we are capable of controlling every aspect of our home from the palm of our hands, at a very low cost. Tap It Open is an Android garage door opener app. No hardware apart from your smartphone is needed. You can open a garage door with your phone’s Bluetooth and it has a user-friendly interface. This Android app is highly secure as it uses Bluetooth security and your smartphone’s password protection. You don’t need to worry about lost or stolen remote controls ever again with this on your smartphone. Tap It Open is specifically a Genie garage door opener app for Android, so you need this type of door for the app to work. Genie has been manufacturing garage door openers for years, but decided to move with the times and add more convenience to their systems via the app. The GoGogate 2 is a device that is used with your smartphone. You’re not only able to control the garage doors but view the temperature sensors and its battery life. This garage door opener app works well with iOS devices. GoGogate 2 works in conjunction with Skylink’s IFTTT connections. You will receive push notifications with regards to the activity of your garage door; if by any chance you left your garage door open, you will receive a notification stating so. Chamberlain specializes in garage door openers and remotes. 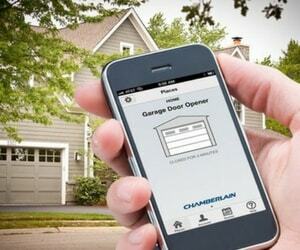 If there’s a development in the possibilities of a garage door opener app, Chamberlain will be leading the pack. The MyQ Home control allows you to control not only the garage door, but also the exterior and interior lights in your home. You can customize the notifications you want to receive. The notifications will tell you about the garage door activities. If you want to know whenever the door is open, the moment is starts opening, then let your app send you a notification. You are in full control with this app. 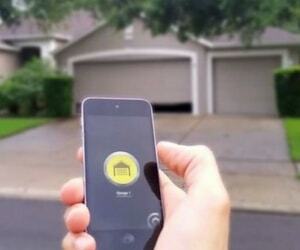 GarageMate allows you to open garage doors with your smartphone’s Bluetooth. In order for this app to work, you will need to use it with the GarageMate receiver. This receiver is easy to install within a few minutes. The receiver is a small dongle that needs to be inserted into an outlet near the garage door opener. The GarageMate you use, will only be allocated to the system on you premises. If someone else has the app they will not have any control over your garage. The only time they will have control is if you grant them permission. With a garage door opener app, iPhone is an important brand to include in the system, because of Apple’s popularity. The app utilizes iPhone’s Bluetooth 4.0 and Android 4.4.3 Bluetooth. This is the securest form of consumer protection, in which you can add multiple passwords. With one app, you can link to as many garages as you want. This app is compatible with most brands on the garage door opener market. This is a garage door opener app without Bluetooth. This app uses biometrics that ensure your passwords and usernames are locked with your voice. This app is successful in keeping your smartphone passwords safe from prying eyes. You don’t run the risk of strangers accessing your system via the smartphone. The Android garage door opener app OpenSezMe affords you complete control over your garage door. With a simple touch of a button you can open and close the garage. However, you will need to connect your Smartphone to a device. The signal is established through a data connection and not Bluetooth. This makes it ideal for those users whose Bluetooth embedded smartphones have not upgraded to the latest software. There are numerous garage doors that can be controlled by a smartphone. 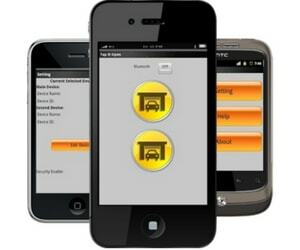 Yes, there is a garage door opener app for your specific scenario and type of smartphone. If you ever lose your remote control, or you don’t feel like carrying one around, there is still a way to access your home. When using a free garage door opener app, you will need a device to link it to the garage door opener. You can either control the operation of the garage doors through your smartphone’s Bluetooth or a mobile connection. One of the best parts about modern technology is that it keeps making life more convenient. What’s even better, is that the apps mentioned here are free.